Maud Stack is a beautiful, vivacious, intelligent, and careless student. Professor Steven Brookman is a handsome, Hemingway-masculine, intelligent, and careless instructor. Of course, we know what this means. It's not long before office hours become after hours, and the classroom becomes the bedroom. In terms of plot, there's nothing new or shocking in Death of the Black-Haired Girl. Professor Brookman is, of course, a very married man who, despite his occasional sexual liaison, is very much in love with his wife, who has recently discovered she is pregnant with their second child. Taking a personal vow to be a better husband and a better father, Brookman decides to end his relationship with Maud, but hell hath no fury like an undergraduate scorned. It's not long before Maud spirals out of control, leading to her eventual death under questionable circumstances in front of the Brookman home. Despite seeming like the setup for a by-the-numbers whodunit, Death of the Black-Haired Girl is anything but. 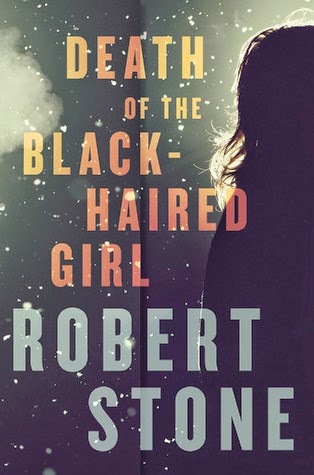 For those familiar with Stone's writing, this shouldn't be a shock and many of the negative reviews I've read come from readers who felt misled. I can't say that I blame them. With a title that conjures The Girl With the Dragon Tattoo and blurbs and summaries that throw around words like "thriller" and "noir," it does seem to project the wrong image. However, I read and enjoyed Stone's Dog Soldiers, so I was eager to enter into Stone's morally-nebulous universe. That enthusiasm did not last very long. Stone uses the aftermath of Maud's death to explore morality in both specific and broad terms. The novel's setting is a prestigious liberal arts college in New England, an academic institution whose motto, Lux in Umbras Procedet, or Light Will Go Forth Into Shadows, hearkens to a vainglorious past, its original mission to bring civilization and God's light to the wilderness. Ironically, in its 21st century manifestation, it has become the place that creates shadows, a place of locks and barriers--no longer seeking to interact with the world, it seems to insulate itself from it. In its attempt to protect itself from outside influence, it's evident that its insular nature is destroying it from within. It is a gray, dismal wasteland populated by the selfish and the insane. As Maud quotes Mephistopheles from Doctor Faustus as saying of the world, "Why this is hell . . . nor am I out of it" (15). After Maud writes a scathing indictment (although, from my perspective, a clumsy, rambling and ridiculously written diatribe that I cannot imagine anyone finding persuasive or brilliant) of the hypocrisy of Christian right-to-lifers that is published in the school newspaper, the college becomes a literal battleground between the secular and the sacred as hundreds of protesters flock to the campus and some go so far as to physically threaten Maud. Many of the characters here seem to be in hell: Maud; her father, Eddie; the school counselor, Jo Carr; and Steve Brookman carry and create their own personal demons. There are also lesser angels presented in the form of the dean's wife, Mary Pick, whose tragic past in Ireland seems to have only strengthened her faith, and Ellie Brookman, who routinely leaves the college to return to the Garden-like existence offered by her Mennonite community in Canada. A woman of deep faith who believes her life to be firmly in the hands of God, Ellie serves as the embodiment of the platonic ideal for Brookman: a constant presence reminding him to do better and be better in light of his past. Discovering her pregnancy months after leaving their home to return to the fold of her family seems to remove her from the sordid sexual escapades at the college, making her pregnancy seem almost immaculate and her presence in Brookman's life divine. So, yes, there's a lot going on here in terms of spirituality, repeatedly dancing at the edge of existential angst and then pulling back again. There's a lot going on in terms of abortion, Christian fundamentalism/radicalism, adultery, marriage, and temptation. There's some beautiful writing (the scene depicting the reaction of Maud's father, Eddie, after he learns of her death is heart-wrenching). So what's the problem? Remember how I said Maud's editorial rant was rambling and clumsy? Ultimately, that's how I felt about the structure of the novel. The story isn't really about Maud's death at all, but splinters off into a dozen different directions, following secondary characters in such a hurried, abrupt way that the reader never finds resolution on any front. It's like Maud's death is a bare Christmas tree from which Stone hangs every vituperative, cynical, and nihilistic bauble he can find. But then he stands back and thinks something is missing. So out come the garlands of devotion and piety as a counterweight. But still, it's not quite right. Maybe some twinkling obvious symbolism lights? The plot becomes so weighted under these conflicting and ponderous messages that I just lost interest. But the real death knell? The host of unlikable characters. Now, don't get me wrong--I'm not suggesting they should be likable in the sense that they should be good (in fact, it is the intended saints in the novel that I find particularly obnoxious), but there should be something about them that I still find appealing. Not so here. Part of my complaint comes from the fact that the novel does far more telling than showing, so many of the characters seem two-dimensional. It doesn't help that these are self-centered, pretentious, beautiful people who are careless with the lives of others. Surprisingly, the only sympathetic character is the one I thought I would loathe the most: Steve Brookman. Despite everything, there's the sense that he did love Maud in some way that went beyond lust. He doesn't come across as a lecherous Humbert Humbert in that what he loved and celebrated in Maud had as much to do with her intellect and her potential as her youth and beauty. In the end, I can only state that Death of the Dark-Haired Girl ultimately seems tedious and unnecessary despite its grander aspirations.